Hello! 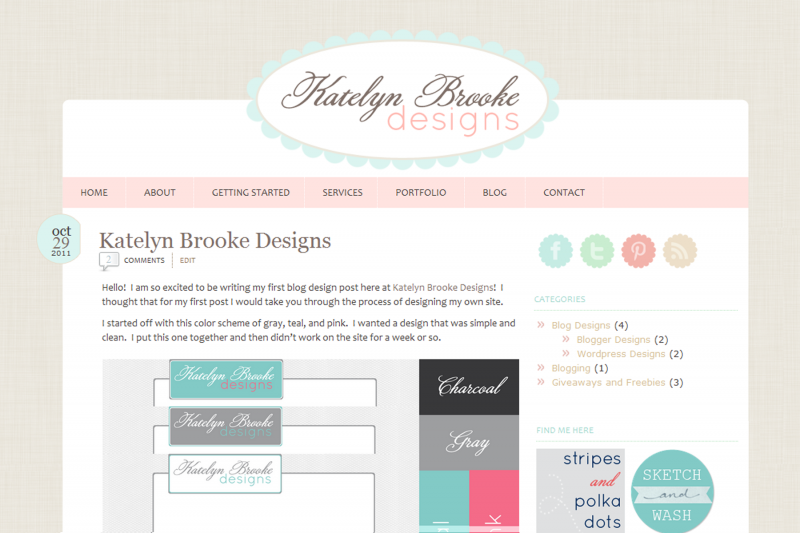 I am so excited to be writing my first blog design post here at Katelyn Brooke Designs! I thought that for my first post I would take you through the process of designing my own site. I started off with this color scheme of gray, teal, and pink. I wanted a design that was simple and clean. I put this one together and then didn’t work on the site for a week or so. When I came back to work on the site, I realized that it just wasn’t doing it for me anymore. Just goes to show that sometimes designing for yourself is the hardest! I felt like the colors were too bold to represent my style and that I wanted something softer. I headed to one of my favorite places to get inspiration: Pinterest! After I had chosen the colors, the rest of the design just sort of fell into place. I liked the idea of scalloped details and rounded edges. I was working from the Family Tree theme and I like the basics of the theme so customizing it was pretty easy. I’m still adding the finishing touches, but this is what I’ve come up with so far! Keep reading for more designs and their inspiration later this week! Hi Katelyn, I LOVE your design! I’m in the BDN workshop right now myself. Good luck with everything!